I got some new things from Jujubeads Jewelry and Cosmetics. The products are always so unique and beautiful. This kind of jewelry ALWAYS gets you compliments and asked where did you get it?? New colors to add to my Jujubeads Cosmetics collection! So pretty!!! Golden Light- I love the matte finish of this full coverage powder. Great product! These are absolutly darling, so perfect! This is LOOOOVVE at first sight!!!! 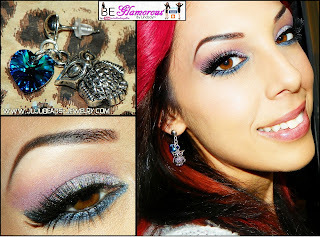 I created a look for my owl earrings using some Jujubeads Cosmetics.